A part of a running research project directed to building coordinated polymers based on the rigid aromatic s-triazine, the researchers reported the synthesis, characterization, antimicrobial, antioxidant and anti-inflammatory activities of four new transition metal complexes derived from the nanosized diol monomer (H2L ligand) as early representatives of its nanosized o-naphthol-based polyester. The reaction of the new nanosized N2O2 donor diimine containing sulfone with zinc (II), copper (II), nickel (II) and cobalt (II) ions offered nonconducting metal complexes. The SEM image showed the diol monomer was organized as well-defined nanosized rod-like morphology. Spectroscopic and magnetic susceptibility studies displayed the tetrahedral geometries for Zn (II), Co (II) and Ni (II) complexes while the Cu (II) complex had square planar geometry. The antioxidant and antiinflammatory activities were in the order [Cu2L2].4H2O > [Zn2L2] > [Ni (HL)2] > [Co2L2] > H2L. Despite the ligand, [Cu2L2].4H2O, [Zn2L2] and [Co2L2] complexes displayed no efficacy against the screened microbes, only the tetrahedral Ni (II) complex exhibited moderate activity. The reporting complexes possessed several notable advantages that render them as promising alternatives for the development of therapeutic agents. Selection of the rigid O-substituted naphthol ring as a source of Odonor ligands is expected to construct high dimensional frameworks and more easily contributing and controlling metallic topology. 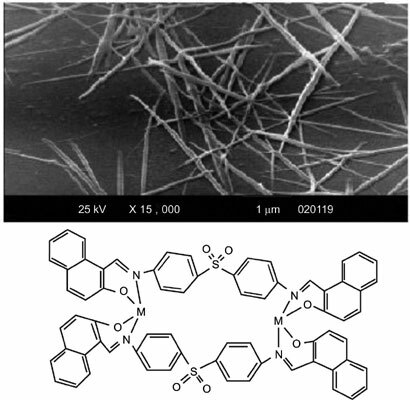 Diol monomer, nanosized, complexes, synthesis, SEM, antioxidant.